This review was originally published as a report on the book at New Spanish Books, and has been reprinted here with permission of the reviewer. The book was originally published in the Catalan by Anagrama as Joyce i las gallinas. Anna Ballbona’s recent, highly praised, debut novel Joyce y las gallinas follows the misadventures of Dora, a young, disillusioned Catalan journalist who commutes to Barcelona by day from the rather hermetic and lifeless suburbs around the small industrial city of Granollers. Dora’s uninspiring assignments, anodyne reporting on inconsequential city hall press conferences and–for the fourth consecutive year–Epiphany parades for children, leave her hungry for more vital literary and artistic experiences. A weekend holiday to Ireland and an unexpected invitation to a Finnegans Wake reading introduce her to Murphy, a Dubliner whose two passions in life are studying James Joyce and raising chickens—not for eggs or meat, but as pets–hence the novel’s title Joyce y las gallinas [Joyce and the Hens]. Sensing in Murphy’s obsession something stranger and more authentic than her workaday life of commuting, reporting on non-news, and playing half-heartedly at the singles game, Dora finds a catalyst (or is it a siren song?) in the Banksy documentary Exit Through the Gift Shop. Under the conceptual spells of mimesis, replication, and transgression, determined to make her own original statement, Dora’s double dose of aesthetic override drives her to adopt an alter ego (Banx) and pursue a new, double life of artistic vandalism—or is it “Banxism”? 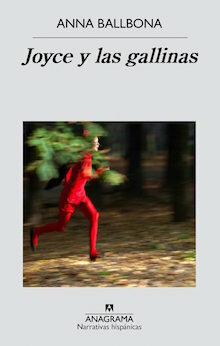 The ensuing comedy of errors reveals Ballbona’s novel to be a clever, tightly-stitched contemporary Catalan Dubliners, a sheaf of echoing episodes exploring problems of identity, self-worth, family ties, technology, sterile voyeurism, the perennial anxiety of influence, and the desire to escape from the endless looping subroutines of social conformity. Dora’s odyssey courses our queasy fear that in a biological world of despoiled wilderness and landscapes, our only escape from the social mandate is an ever-circling flight within our own manias. This includes how Murphy’s hen obsession echoes through Dora’s story in a variety of gallina permutations both silly and serious, as she associates freely and comically about hen-based memories from her past, and begins seeing, with ever-greater significance, new and different ones in the strangest of places. Ballbona’s multifaceted central metaphor, “gallinas,” certainly stands for the traditional Spanish mother, domineering and devoted, the mother hen who keeps family and society meaningfully intact, but also, in our early twenty-first century, stranded in an increasingly anachronistic past. Of course, in English, “gallina” also means “chicken”—both as the helpless candidate for the stewpot and as a blinking, clucking coward. So in Anna Ballbona’s satire, seemingly as familiar and innocuous as a hen’s white egg, we all turn out to be chickens. This is a novel about deception (legal, illegal, and extra-legal), self-delusion, people (all of us?) who hide in plain sight and live in perennial desire for, and fear of, self-exposure, insisting on false appearances even as we (pretend to) revile them. It’s a satire on the cloistered voyeurism that results from our inability to relate to family and society as traditional life is erased, and replaced, dualistically, by an implacable technology and a fractured aesthetic to which we find ourselves beholden, whose implications we cannot understand, but to whose chimes we pirouette, enthralled and in thrall. Seeking to enact a masterful Joycean-Banksyan performance (one that seems patently ridiculous until we see that it’s really something else), Dora appropriately plays a strange and elaborate game of chicken with her community, right up until the very suspenseful climax, perhaps achieving what she intended, and perhaps achieving something worse, perhaps inevitably so. Dora wants to rouse the world from its somnolence, but is she really the blind sleepwalker, oblivious to the absurdity of her mimesis? In addition to clear, measured and subtly wry prose, engagingly cerebral with a light touch, Joyce y las gallinas also sports a fine and effective cast of secondary characters. Most notably we meet–following a strange encounter between a tennis aficionado and a Rottweiler–the noxious Alfred—a sleazy, henpecked forty-something dysfunctionally devoted to his mother, Engracieta—who provides sinister comic menace and vital suspense. It’s a happy fact of geography for Ballbona that one of the familiar train depots heading out of Barcelona to Granollers, a busy stop on Dora’s daily commute, is Montcada Bifurcació. In a book about double lives and alter egos (Jekyll and Hyde is/are name-checked early on) this is a resonant binomial. Montcada is a small mountain at the north end of the Collserola massif; conspicuously quarried away for generations, it is gradually being flattened to nothing—a mountain ceasing to be a mountain, a name without a place, a place without its namesake. It is not unlike the questing Dora—a young Catalan woman at odds with her people, place, and tradition; a journalist who finds little meaning in daily life, who feels herself a very bland sort of belle du jour, a woman who finds a kind of cowardly courage to become, by night, a headless chicken on the run that really wants to be a crowing rooster. Birfurcació means, of course, bifurcation, and as Dora dwells on that train stop, (and given the novel’s wild, peculiar climax that feels rather more Flann O’Brien than strictly Joyce), bifurcation brings to mind Jorge Luis Borges’ signature story “The Garden of Forking Paths” (in Spanish, El jardín de los senderos que se bifurcan). And just as Borges’s koan-like fiction of forking fortune leaves the reader reverberating with wonder and doubt, Ballbona’s slender, artful dodger of a novel plays its black box finale with a very deft sleight-of-hand.